Hello! 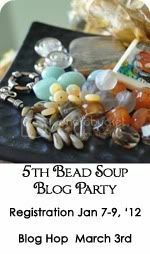 I am very happy to be involved in another Bead Soup Blog Hop. My lovely partner is Kiersten Kern of Red Opal Designs. She makes the most beautiful lampwork glass beads. Kiersten lives in Ann Arbor, Michigan. You can check out her gorgeous jewellery at Red Opal Designs. Stop by Kiersten's Facebook page and say "hello". Our reveal date is April 6th and we have both sent and received each others beads. Here are the beautiful beads I received from Kiersten. Gorgeous Greek Ceramic Beads and Blue Soapstone with Sterling clasp. ﻿I can't wait to get cooking with this gorgeous soup! The lampwork focal bead is gorgeous - love it! 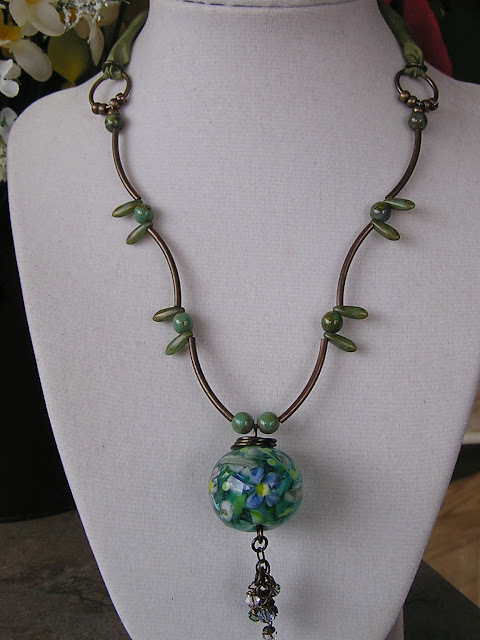 I dabble in a bit of glass bead making myself and would love to be able to create beads like Kiersten's. I already have a few ideas of what I am going to make so stay tuned! 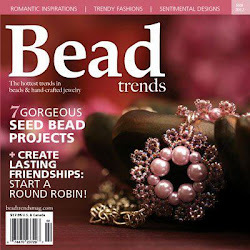 As always a huge "thank you" to Lori Anderson for organizing this wonderful Bead Soup Blog Hop. 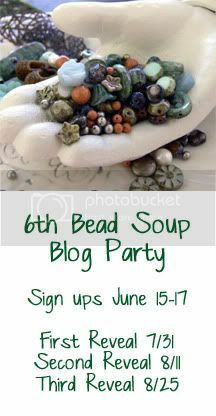 Check out her blog and click on the Bead Soup link to see who else is participating. I have several unfinished necklaces on my bead table :) I have been playing around with Ice Resin again and have made a couple of sealed pieces with image art from my friend Tina at http://www.etsy.com/shop/Glimmersmith. 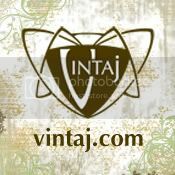 Check out Tina's shop for individual images. I love being able to buy just one image instead of a whole sheet for maybe one or two that I would want to use. I fell in love with this image of peacocks and just knew I had to have it! Unfortunately my Ice Resin is rather old so I think I will end up redoing this one. The beads are Czech glass with smaller faceted green glass beads. What colours do you like to work with? 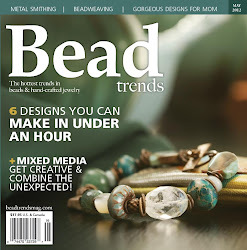 I'd love you to share what's on your bead table too. If you would like to leave a comment that would be awesome! 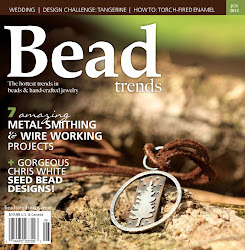 I think it's time for Bead Soup! As you can see I had a wonderful selection of beads and beautiful colour combination to work with. The hollow focal bead was a bit of a challenge (in a very good way). I have never made anything with a hollow bead before and I must confess that it had me flumoxed for a a few minutes. After studying it a bit longer I decided that it looks like one of those glass buoys you see with fisherman's netting around them. I love anything to do with the sea so I set about making the necklace below. I used the Russian Amazonite chips with freshwater pearls and dangled a teensie seahorse charm and an anchor charm. The chunky/rustic chain reminds me of old treasures from the ocean. I wound wire and hammered it flat and then added a brass bead I had coloured with patina and then the gorgeous focal bead. The chain,wire and charms are beautiful Fallen Angel Brass. The bracelet below also has a beach theme. I love the frit beads and the pebble spacer beads. They are such gorgeous blues and greens. I paired them with silver spacer beads, freshwater pearls and peanut beads. The starfish charm is pewter and matches the toggle clasp beautifully. For the earrings I used Christina's gorgeous frit beads and added flattened Vintaj Brass bead caps. I repeated the look of the bracelet by using the little silver spacer beads and the tiny czech glass seed beads. Thanks to my wonderful bead soup partner Christina for sending me such beautiful beads to play with. Click on a name below to visit other participating blogs. Have fun!!! Another Cup of Bead Soup! Well it is sad to say that I have very much neglected you dear blog over the past couple of months! Yikes - didn't realize how long it was since my last post. Hope that everyone is enjoying the summer and keeping cool! Yay!! My partner this time is Christina Stoomfel from The Netherlands. Christina is a jewellery designer and a self taught lampwork artist and her beads are just gorgeous! Check out Christina's work on Etsy and also on her blog. 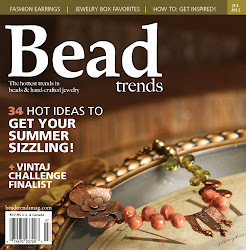 I am thrilled to be Christina's partner for my second Bead Soup Blog Hop! I am looking forward to getting to know Christina over the coming weeks. Stop back and see photos of our Bead Soup soon! Our reveal date is August 11th 2012. We currently have 280 FB fans and will announce another giveaway when we reach 350 fans. Stay tuned to this page! Woot! Woot! It's Giveaway Time!! Hello and Welcome to our new blog followers! 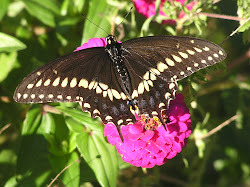 We've had a wonderful month with some gorgeous weather. Hope you have all had the chance to enjoy some outdoor time too. You can enter to win up to 3 times. 2. Share on Facebook and leave another comment on this post to say you shared. 3. Join our blog and leave another comment on this post to say you joined. We will pick a winner with Random.org on Thursday 19th April 2012. We will post the winner's name on our blog on Friday 20th April 2012.